This year marks the 100th anniversary of celebrated children’s author Roald Dahl, who over his lifetime delighted and even traumatised an entire generation with twisted and eccentric tales such as Charlie and the Chocolate Factory, Matilda, Fantastic Mr. Fox, and countless others. However, one of his more famous tales, that of a gentle creature known as the Big Friendly Giant or the BFG for short, is noticeably lighter in comparison to his much darker stories, and even when it does go into some of its more disturbing notions such as the prospect of being eaten alive by huge monsters, it’s still a much more soothing prospect than, say, a sadistic chocolate factory owner severely disciplining and sometimes endangering misbehaving children on an exclusive tour. It’s definitely one of the author’s safer and thus more child-friendly entries in his bibliography. Prime material, then, for the likes of Steven Spielberg to adapt as a major new summer release, with the director returning to the family-friendly territory he previously made his mark on with E.T., Hook and The Adventures of Tintin, and taking Dahl’s precious source into a film that will no doubt entrance younger members and leave others in a fairly amused state. The story, if you’re not that familiar, begins as a bespectacled young orphan named Sophie (newcomer Ruby Barnhill) is one night snatched up by a large man she sees in the street, and whisked away to a remote land known as Giant Country where her captor introduces himself as the Big Friendly Giant (Mark Rylance, on his second Spielberg film in a row after his Oscar-winning turn in Bridge of Spies) who, despite his size, is completely harmless and has no desire to gobble up the “human bean” Sophie, unlike his much larger bullying neighbours such as the Fleshlumpeater (Jemaine Clement). 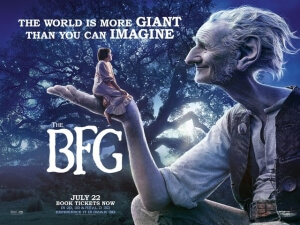 The two share a special bond with each other, and after a series of adventures which include the BFG’s job of catching and delivering dreams to the people of the world, they decide to stop the other giants once and for all, with a plan that somehow involves the Queen of England (Penelope Wilton). You can immediately recognise what drew Spielberg to this property in the first place; Dahl’s story is full of magic and whimsy, always with its heart in the right place, and – not to overuse a tired phrase – contains something for everyone, from heart-warming scenes of friendship and loyalty for adults to ponder over, to scenes of slapstick and toilet humour to make younger children roll in the aisles (and yes, while Spielberg is a talent that is way above fart jokes, how they’re used here – and to whom – is enough to make even the grumpiest adult chuckle at their absurdity). Spielberg takes the wonder that Dahl poured his heart and soul into originally and, through E.T. screenwriter Melissa Mathison (who sadly passed away last year, making this a bittersweet swansong in context), has crafted a film that Dahl could very well be proud of, were he still around today; it has a heart as big as its title character, played with extravagance and passion by a motion-captured Rylance, while also not neglecting its much darker overtones entirely, although the end product is still undoubtedly much more kid-friendly. Spielberg and Mathison together have managed to adapt Dahl’s story mostly successfully, although not without a few bumps here and there. The story, as charming as it is, is very light and doesn’t have enough material to justify a two-hour running time, so a lot of scenes do tend to drag on a little bit longer than necessary and you do find yourself eager to get on with it faster than the film itself. It all amounts to an ending that seems very sudden and anti-climactic, as though Spielberg had finally gotten as much out of the story as he felt he needed, and just decided to end it right there and then rather than build it up to a stronger payoff. The decision also to make the giants and some of the environments entirely CGI can also be a little distracting, as the giants can somehow look more cartoony than the 1989 version with David Jason, and you keep wondering how or if it could look better if Spielberg had pulled these effects off practically instead. For all its faults, though, The BFG is still a completely serviceable slice of summer family entertainment from two very different, but also very similar, storytellers, both of whom are undisputed masters of their craft. The BFG is a charming and wholesome slice of summer family entertainment that does Roald Dahl’s story proud, as director Steven Spielberg retains the original’s heart and sense of wonder while adding his own sense of whimsy and delight to make even its fart jokes look artful and joyful.